Synthmaster 2.x, Virtual hybrid synth from KV331 Audio. KV331 Audio has released version 2.5 of SynthMaster, a semi-modular synthesizer and effect plug-in for Windows and Mac. With version 2.5, SynthMaster becomes a cross-platform plug-in running on Windows (32/64 bits) and Mac OSX (32 bits) operating systems in VST and AU formats. The latest version comes with 400 new factory presets, and introduces new filter types, improved filter algorithms with pre/inside/post distortion routings, stereo oscillators with improved unison, vector synthesis with 2D envelopes, sample playback (SFZ) synthesis, improved arpeggiator, improved modulation architecture, improved easy parameters, online preset browser, multiple skins, flexible effects routing, improved effects as well as 3 new effects: Phaser, Ensemble and Compressor. Cross-platform VST & AU: SynthMaster 2.5 now runs as a VST instrument/effect on both Windows and Mac OSX, and as an Audio Unit instrument/effect on Mac OSX. 400 New Factory Presets: SynthMaster 2.5 comes with 400 new factory presets from sound designers such as BigTone, Ümit ‘Insigna’ Uy, Frank ‘Xenox’ Neumann, Teoman Pasinlioglu, Mr Shoufuku and Brian ‘Xenos’ Lee. Improved Filter Algorithms: The ‘analog’ filter models have been improved to model the analog ladder filter. The ‘digital’ filters on the other hand have been rewritten. Before/After/Inside Filter Distortion: Custom distortion stage added into the filters so that signals can be distorted before, after or inside the filter. It is now possible to create screaming sounds using the filters in SynthMaster. ‘Multimode’ Filters: With the new ‘multimode’ filter type, it is now possible to switch from Lowpass to Bandpass to Highpass filter types using the ‘filter mode’ parameter. For analog multimode filters, it is possible to change the slope of the filter continuously from 0 db/oct to 24 db/oct using the ‘continous slope’ parameter. ‘Dual’ Filters: With the new ‘dual’ filter type, it is now possible to run two multimode filters simultaneously, either in parallel, or in series. The mix ratios between the filters, and the topology (parallel/series) between them can be changed continuously, as well as the modes and cutoff frequencies of the filters. Vector Synthesis: A new ‘vector’ oscillator type has been added to add support for vector synthesis in SynthMaster. 2D Envelopes: A new envelope generator type called “XY envelope” is added, so that line segments between points in 2 dimensions can be used to generate 2 dimensional envelope signals. XY Envelopes can be used for modulating “vector” oscillator x/y indexes, but also for other voice parameters within SynthMaster. Sample Playback (SFZ) Synthesis: A new “sample playback” oscillator type has been added so that SFZ files can be played back. It is also possible with version 2.5 to generate SFZ files by dragging and dropping multiple WAV/AIFF samples onto an oscillator waveform display. Stereo Oscillators with Improved Unison: Oscillators in SynthMaster 2.5 have now stereo output. With the new “voices”, “pan spread” and “detune spread” parameters, each basic/wavescanning oscillator can have its own unison settings which eliminates the need to enable unison for all voice elements. Improved Arpeggiator: The number of steps in the arpeggiator is increased to 32, while classic arpeggiator modes such as up, down, updown, downup and as played are added as well. Drag and drop of MIDI files onto the arpeggiator display is also possible now so that monophonic/polyphonic sequences can be imported into the arpeggiator. Improved Modulation Architecture: The modulation architecture has been improved, so that now there are 3 modulation sources available for each modulation target. A modulation matrix with 64 slots is also added. The matrix has filtering as well so that targets for a specific source, or sources for a specific target can be filtered and shown on the user interface. Improved Parameters: The parameters can now be globally linked to MIDI controllers, and they can be assigned automatically by SynthMaster. Online Preset Browser: Registered users can now upload their own presets to the online preset library, or browse and download presets created by other registered users; using the preset browser right inside the plug-in UI. 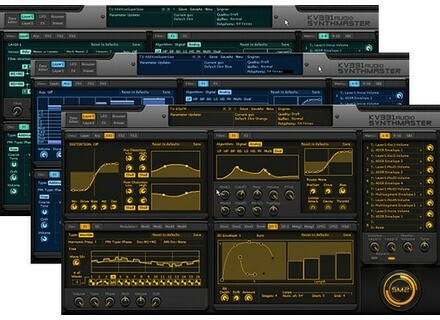 Multiple Skins: SynthMaster 2.5 comes with 3 different skins in different color variations. Using the included user interface editor, users can customize the existing skins but also can create their own custom interfaces as well. Effects Routing: With version 2.5, there is no more the differentiation of layer/global effects. Each effect can be inserted on a layer or on one of the 2 global effect buses. Better Reverb: The reverb effect in SynthMaster 2.5 has been improved and now it is a reverb with parameters such as 2 band EQs for early/late reflections, early/late mix ratios, damping control, distance and room size. Better Delay: The delay effect in SynthMaster has been changed and now it contains a 2 band EQ and a custom distortion curve to filter and distort the delayed input signal. Better Distortion: The distortion effect in SynthMaster has been changed and now it contains 2 band EQs before/after the distortion stage and a custom distortion curve as well. New Effects: 3 new effecs are added to SynthMaster: 4/8/12/16 stage Phaser, 2-8 voice Ensemble, and Peak Compressor. 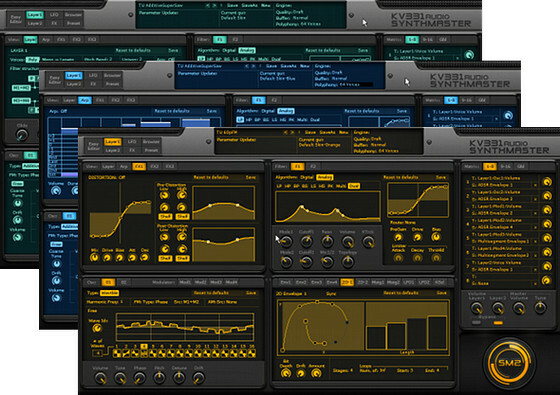 SynthMaster 2.5 is available to purchase for the introductory price of $99 USD until October 15th, 2011 (regular $129 USD). Academic licensing is also available for students, teachers and academics for $59 USD. Following the release of SynthMaster 2.5, KV331 Audio will start releasing preset expansions for different genres. The first expansion pack will be Rob Lee’s House/EDM expansions, scheduled for release by the end of November 2011. Analog In The Box W735 EQ Analog In The Box has released the W735 EQ VST effect plug-in for Windows. SonoReplicator VST SonoReplicator has announced the release of SonoReplicator VST, a VST effect plug-in for Windows designed to turn standard speakers and earphones into acoustic copies (replicas) of studio monitors or any other real or ideal speakers and earphones. Best Service Chris Hein Horns Compact Best Service introduces a new library of Brass & Woodwind instruments for Jazz, Pop, Big-Band, Funk and Cinematic Productions.